I am a broken man. This is not some sort of existential breakdown, well at least not directly, more that we spent the three-day weekend beginning the task of turning our garden from a space into our space. And now I ache. Deeply. Everywhere. If I have learned anything about gardening it is this – gardening is an act of subtraction. As much as we can plant and adorn our land, the everyday acts of gardening are all about removing something. We weed, pick fruit, cut the lawn, prune, deadhead, pick off bugs and slugs and snails. We take away more regularly than we add. And this is no more apparent than with a new garden. We inherited what appeared to be a blank canvas – a patio, an empty flower bed, a reasonably sized lawn. It looked ready for addition. Yet, upon further inspection, even this sparse space needed sorting. We had found a few odd bricks just beneath the grass. 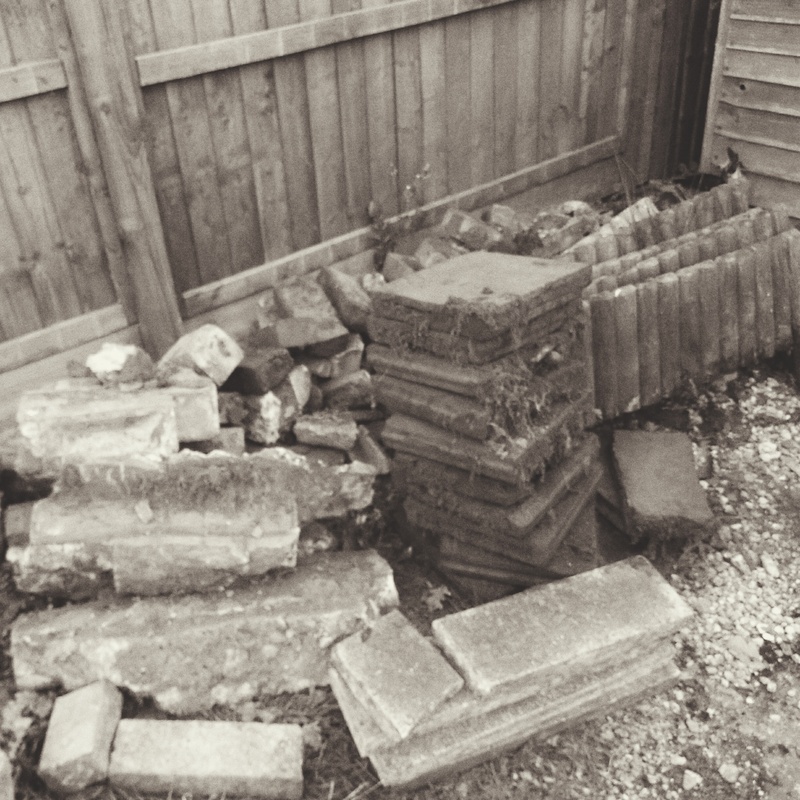 As I began digging them up I realised there was a whole wall buried underneath the lawn. I essentially needed to demolish a wall, but a wall that was underground. Digging, hammering and chiseling, I eventually got rid of most of the wall. The remaining hole needed filling, so I began digging a patch to the rear of the garden, an area ultimately better suited to planting than being the sloping, scraggy lawn that was there. And as I dug this patch I uncovered more debris. Bricks, concrete dividers and large red slabs emerged. Gardening is often promoted as being a good way to get closer to nature. All of this digging felt more like getting close to the past, with me the particularly ham-fisted archaeologist uncovering the works of previous settlers, attempting to decipher what their intentions were, while simultaneously undoing all of their hard work. Who built all this and why? And who smothered all this and why? What had naturally grown over what, and what had happened by design? All I had to show for it was a large pile of rubble. The challenge now will be working out what can be repurposed, and how. This kind of gardening is also an act of delayed gratification. Sometimes the fun has to wait, and sometimes you have to find the fun in the thankless tasks. There is a real satisfaction in a toiled piece of earth, in a new vegetable bed ready for planting, or a fixed lawn. So, late on day three the planting could finally begin. Enough had been removed for something to be added. We are aiming for something more considered than perhaps we’ve tried before. There will hopefully be a degree of structure and height to the planting, some symmetry and rhythm as plants repeat across the garden. We planted dogwood, for height and greenery in the summer, and the bright yellow and red bark in the winter. African daisies, in orange, offset the dogwood nicely. Lavender will hopefully spread and offer fragrance. More plants are to follow, but the sun was setting and dinner was calling. Even planting these few things saw the subtraction continue. The flower bed was not as it seemed. Under the decorative bark there wasn’t soil, but instead layers of plastic sheeting, with small white stones between, then finally cold, damp, clay-like soil. Planting involved removing these barriers – a pain at the time, but I hope this means less watering and weeding in the long run. So, the garden keeps yielding surprises. I hope future surprises relate to growth, not more strange things to remove. I guess we need to adapt to nature, but also the acts of our predecessors. You’re a better gardener than I am! When I discovered an underground wall, I would have replaced the dirt as best I could and put up a bird feeder instead. Great work planting dogwoods, I’ve planted them this year and they are spectacular.